Background: Forskolin, a polyhydroxylated labdone diterpene extracted from Coleus forskohlii possesses various medicinal properties and has been used in the treatment of number of chronic diseases, in humans. Objectives: The effects of forskolin and its analogues (1a-1f) on COX-2 enzyme activity were evaluated (in silico and in vitro studies). Results: The in silico studies revealed that forskolin analogue (1b) exhibited highest binding score of -9.8 K cal mol-1 and formation of hydrogen bonds with Arg120, Glu524 and Ser530 amino acid residues, similar to celecoxib. The in vitro studies revealed that the tested compounds (forskolin, 1b, 1e and celecoxib) inhibited COX-2 enzyme activity in a concentration dependent manner and the IC50 value for forskolin, 1b, 1e and celecoxib were found to be 123 nM, 75.2 nM, 84.8 nM and 90.2 nM respectively. 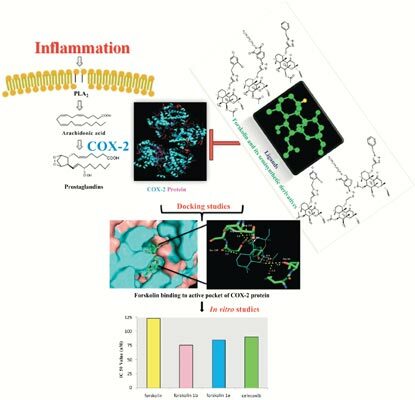 Conclusion: This is the first report on the evaluation of effects of forskolin and its analogues (1b and 1e) on COX-2 enzyme specifically to substantiate their anti-inflammatory potentials. Keywords: Forskolin, forskolin analogues, anti-inflammatory agents, Cyclooxygenase-2, celecoxib. Keywords:Forskolin, forskolin analogues, anti-inflammatory agents, Cyclooxygenase-2, celecoxib. Abstract:Background: Forskolin, a polyhydroxylated labdone diterpene extracted from Coleus forskohlii possesses various medicinal properties and has been used in the treatment of number of chronic diseases, in humans.